Do you have any kids that are stuffed animal hoarders?? This is the perfect activity for them! We're kicking off our Toddler Winter Games with some bobsledding! All you need for this activity is a cardboard box, stuffed animals, and some white paper/tape to wrap the box up (if you want). We also added on an American flag since we're participating as Team USA this week. The kids brought down every single one of their stuffed animals... and each one got a turn to race! You also need to make some sort of ramp to use as your bobsled track. 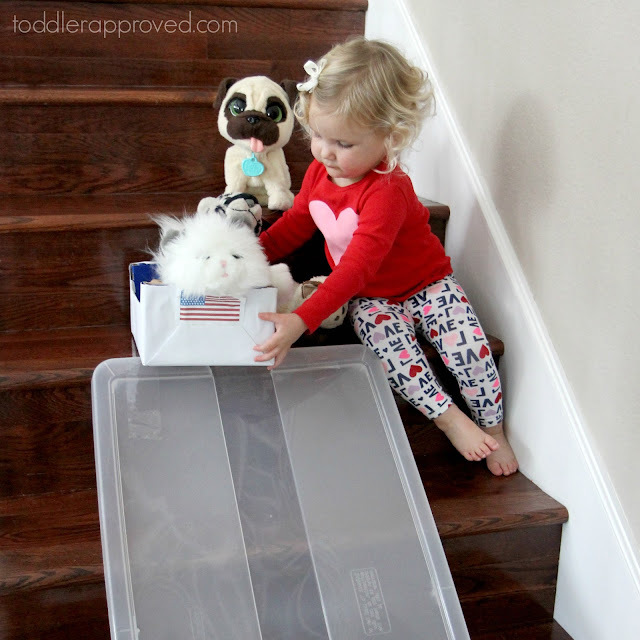 We just used packing tape and a plastic lid on the stairs for our ramp! Once your bobsled is decorated and outfitted with a crew, you're ready to race! Kids love to decorate boxes, so in addition to a flag, you could have them cover their bobsled in stickers or other decorations... kind of like we did with our cardboard gingerbread houses earlier this year. Toddlers on stairs can be a little scary. 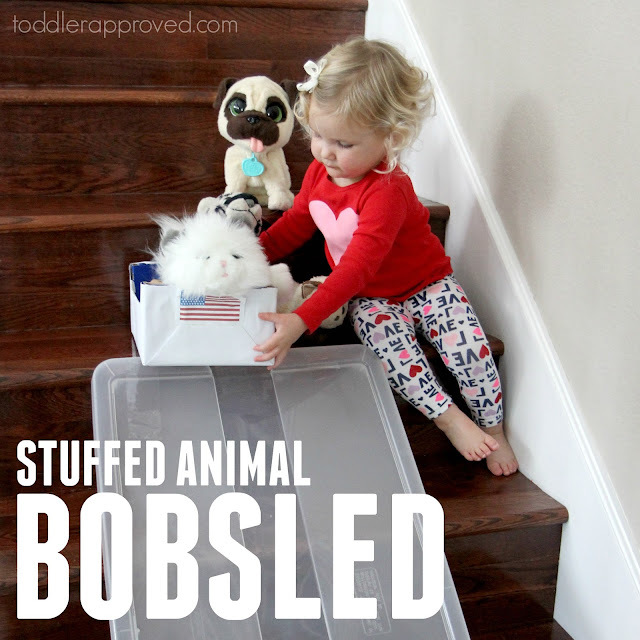 Make sure your little one sits down next to the ramp (not above the ramp), so that when she launches her bobsled she doesn't tumble down the stairs afterwards. Also, some toddlers might watch the animals slide down the bobsled ramp and want to join in too! I'd recommend a less breakable surface if your kiddos want their own ride down the stairs. Some of my friends let their kids ride down the stairs on sleds or on sleeping bags... but since we have all wood stairs, so make a clear "no riding on the ramp" rule when we get started. My daughter thought it was hysterical each and every time the animals crashed into the ground. If the stair ramp isn't for you, your toddler can just push the bobsled box with animals in it all around the house. If you have a bigger box, kids could just push each other in their big bobsleds all around the house. You can also tape the ramp to a wooden chair or small table if you don't have stairs in your house. If you want to do this as a family activity, have each family member decorate a box to represent a specific country and select a "team" (aka stuffed animals). Then, have each family member race their bobsled down the ramp and keep track of how fast they go! Time each bobsled and figure out which bobsled team is the fastest! We always like to give out medals for the fastest or most creative bobsled when we are finished! We host a family Winter Games every four years and last time this activity was the most popular! DOES YOUR TODDLER HAVE A FAVORITE STUFFED ANIMAL THAT HE WILL BE RACING? Stay up to date with our other Toddler Winter Games activities over on our Winter Games Landing Page. By the end of this week, you'll have 10 fun activities to try!